The ghosts and goblins in our homes might be more than Halloween decorations fashioned from scissored bed sheets and carved pumpkins -- so say a large number of those recently surveyed about living in a haunted house. According to the poll by Realtor.com, more than a third of the consumers it questioned reported living in a haunted house, or at least in one that they suspect might be. And 63 percent said that they either would be willing to buy a haunted house or at least consider it -- though far fewer would pay full market value. 2013's Haunted Housing Report from the real estate listing and news site asked 1,400 consumers a few weeks ago a variety of questions about their experiences with and attitudes toward haunted real estate. Among the "warning signs" of a possible haunting: 61 percent cited a cemetery on the property; 50 percent, a home being at least a century old; while 45 percent said a very low price and a quick change of ownership. Close proximity to a battlefield was a concern for 43 percent. Of those who would buy a haunted home, many said they'd only do so at a deep discount. Such a home would have to have a purchase price greater than a 30 percent, said 41 percent of the respondents, before they'd even consider buying one. But don't bank on deciding once you're ready to buy. Chances are you will not know that a house is haunted, because in most states the seller will not have to disclose purported paranormal activity -- as seller disclosures tend to focus on the structural issues of the home. The main way to find out: "Do your homework about the property. Go poke around the neighborhood. Ask questions," says Leslie Piper, a consumer housing specialist for Realtor.com who is also a licensed San Francisco Bay-area agent. Piper told AOL Real Estate that she once bought a haunted house without realizing it. Although she never saw a ghost or spotted levitating objects, Piper says she did have eerie feelings about her Victorian home and had a reputed expert in such matters burn sage there as a way of removing the spirit. "The concept of a house being haunted is one thing," says Piper, "but actually seeing it, takes it to another level." For instance, most survey respondents -- 75 percent -- said levitating objects would keep them from buying the home, whereas somewhat fewer -- 63 percent -- felt that they would be dissuaded by ghosts. Sixty-one percent said that they'd be scared off by "flickering lights/appliances" or "supernatural sensations," with 60 percent expressing wariness about "strange noises." In 2012, Michele Callan and her then-fiance, Josue Chinchilla sued their landlord for a $2,250 deposit on a Toms River, N.J., home that they claimed was haunted, AOL Real Estate reported. The couple claimed to be victims of disturbing paranormal activity that included menacing voices, flickering lights, moving bedsheets and clothes mysteriously flying from closets. Others, meanwhile, relish the possibility of a haunted encounter. 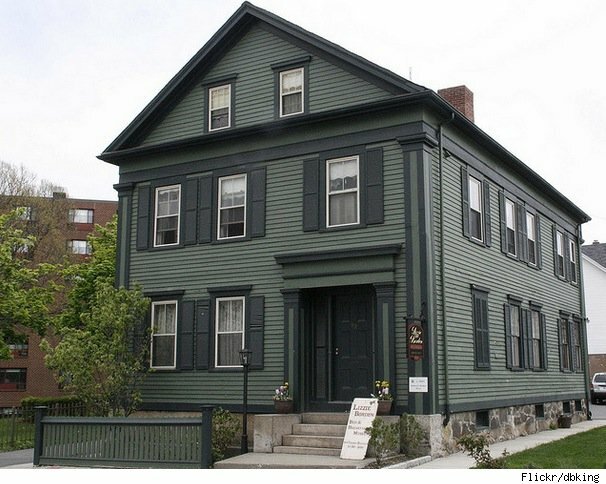 The owners of purported axe murderer Lizzie Borden's former home (pictured above), where she reputedly killed her parents, rents as a bed and breakfast for those hoping to spot the ghosts of Andrew and Abby Borden wandering the grounds. In this town known for the novel "The Legend of Sleepy Hallow," they go all out for Halloween. Philipsburg Manor (pictured) transforms into the "Horseman's Hollow," a terrifying landscape ruled by the undead, the evil, and the insane, reports the Tarrytown Patch. The town is also known for the Great Jack O'Lantern Blaze, with more than 5,000 individually carved and illuminated pumpkins. In Sleepy Hallow there is also a masquerade ball, haunted hayrides, and a dramatic performance of "The Legend of Sleepy Hallow," complete with a headless horseman and Ichabod Crane. See a home for sale in Tarrytown. Anoka bills itself as the Halloween Capital of the World. It is believed to be the first U.S. city to put on a Halloween celebration to divert youngsters from pranks. "When Anokans woke to find their cows roaming Main street, their windows soaped and their outhouses tipped over, they decided something had to be done," reads the history section on the Anoka Halloween website. The celebration was born in 1920. More than 20,000 spectators line the streets to watch the annual parade. The photo shows a graveyard scene from the town. See a home for sale in Anoka, Minn. Ghosts from the War of 1812 reportedly still visit the French Quarter, and the souls of tortured slaves who were once chained inside the LaLaurie Mansion (pictured) are said to still roam its premises. The 10-day Fantasy Fest began in the late 1970s and has become the most revenue-producing period in the Key West. One event is a visit to the Haunting of Fort Zachary Taylor, which hosts the Vampire's Ball costume party and the Theater of Chills, a showing of black and white horror films. The Fantasy Façade Competition is when homes and businesses deck out for the holiday, but for a real scare try the Key West Ghost and Mystery Tour to explore the haunted and hidden side of the island. This off-the-beaten-path tour takes you inside several haunted Victorian mansions. Pictured, a partier proceeds down Duval Street in Key West, Fla., during the 2012 Fantasy Fest Parade. The procession is a culminating event for the island city's annual costuming and masking celebration. See a home for sale in Key West. The Witches Capital of the World due to its infamous Salem Witch Trials, this town comes alive for Halloween and Haunted Happenings. The Salem Night Tour helps you relive famous places of legend and lore, take you on sites of the Witch Trials, and through cemeteries. Your are lead through 15 haunted sites by trained paranormal investigators. There are also three original ghost stories told in Salem's 1630 Village at Forest River Park, inside three different cottages. While in town, stop by to visit the shop of Lori Bruno, a self-proclaimed psychic who says she is descended from witches. See a home for sale in Salem.